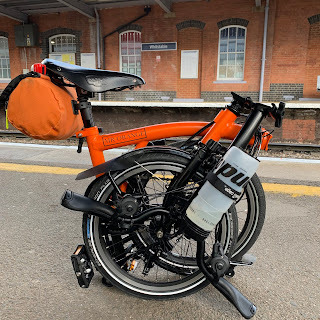 My Orange Brompton: Packing Light for the All Nighter!! Tomorrow will be a busy day and I don't really want to leave the packing of all the items I am going to need for tomorrow nights all night ride to the last minute. 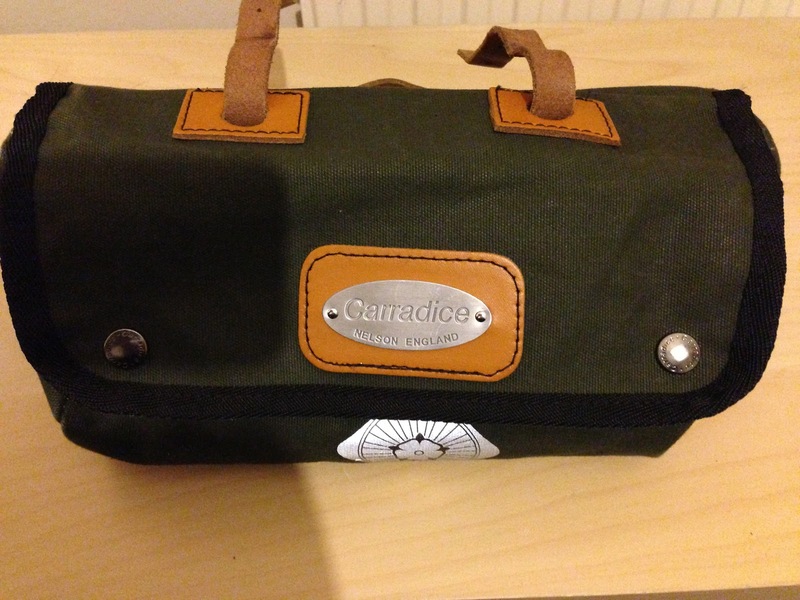 With this in mind I have the choice of my two Carradice saddlebags - Roll Bag / Barley Bag. At the moment I think that I will be taking the Roll Bag as it is a smaller and lighter package. I have laid out the usual items I take with me and listed them below. (Left to right). 1 Spare batteries for front lights and rear lights. 2 Glasses case and glasses in case my contact lenses start to pinch at 03:00! 3 Park Tool allen key tool. 4 Schwalbe spare inner tube. 5 Genuine Innovations Air Chuck and C02 cartridge. 8 Kuhn Rikon Flask (bought for me by David (Navigator) P.
9 Power Walker portable USB battery charger. 10 iPhone Thunderbolt cable for above. 16 Altura Night Vision Over Trousers. (Items 14 - 16 aren't in the photo as I couldn't get them in shot. All of the above fits in with some room to spare). It is surprising the amount it fits inside! It is strange to think that my version of travelling light before I bought the Carradice Saddle Bag was to have taken my Brompton S-bag! How times have changed!